If you have old scarves that you don’t want to wear anymore, don’t chuck them out just yet – there are lots of creative and useful things you can do with them. Scarves are great for turning into clothes because they often have such bright and unusual prints. If you have a large fabric scarf you could turn it into a top to wear yourself or to sell or give away. These scarf tops are great for beach holidays or a clubbing outfit. Fold the scarf in half to form a triangle. Simply wear it with the triangle at the front and a very secure knot at the back. If you are worried about your modesty you can wear a vest top underneath. Scarves make a classy alternative to wrapping paper. You can secure the package by tying a few knots or using double-sided sticky tape. Alternatively, wrap the parcel up loosely and secure with matching ribbon. You can also use them to line nice boxes when you’re giving a present. A few fabric scarves linked together makes an excellent curtain tie back and is perfect for the fashionable shabby chic look.The best way to create a curtain tie-back is to plait three scarves together with an knot at either end. If you have lots of scarves you no longer want, you could make bunting. You will also find old scarves very cheaply in charity shops. Get a piece of ribbon the length that you need the bunting to be. Don’t forget to leave enough length for the bunting to be knotted up. Fold the scarves in half into a triangle shape and place them over the ribbon, at an equal distance apart. Then, all you need to do is sew along the ribbon carefully in a straight line. It’s easiest if you use a sewing machine but you could hand stitch if necessary. 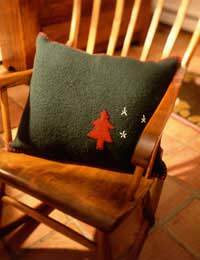 Cushions are a great way to brighten a bedroom or living room and also make nice gifts. For the co-ordinating fabric you will need to cut one piece of fabric that is the same width and half the length of the cushion. The other piece needs to be the same width and three-quarters of the length. Add a little extra for a hem too. This will create a flap to get the cushion in and out of. Iron light interfacing onto the wrong side of the scarf and the fabric if the fabric is quite light. If it’s heavier you won’t need to. Hem one of the longest edges of each of the pieces of fabric. Take the scarf and the fabric and place them right sides together. Make sure the raw edges of the fabric match up with the outside edges of the scarf. Pin. Stitch all four edges, then turn the case the right way out. Insert the cushion pad using the flap.